We want to hear your writing at Novel Nights. Each month we offer three writers the opportunity to read in front of a live audience during the first half of Novel Nights. The audience are a group of friendly writers and readers. You will be on the same bill as an established author. We want to hear prose which delights, tells a story with skill, that hooks a room of people and won’t make them fidget. If you are chosen to read you get free entry to Novel Nights, your name on the programme and publicised on twitter, facebook and on this website. We accept novel extracts and short stories. At least three of us consider your work. We look for strong, well-crafted writing that will delight and excite an audience. We choose extracts that fit in with the theme of the night or that fit with each other. If you are not chosen it doesn’t mean we think your writing is not strong enough! These things are subjective. You will be introduced and the compere for the evening may ask you a couple of questions about your writing or story. You share your writing to riotous applause! 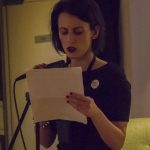 Fancy being a guest speaker at Novel Nights? We’re keen to have speakers who want to share an aspect of writing, genre, writing craft, or anything else that might interest a group of other writers. The guest speaker slot consists of a talk, tips & Q and A. We pay. The audience is well-read and well informed.